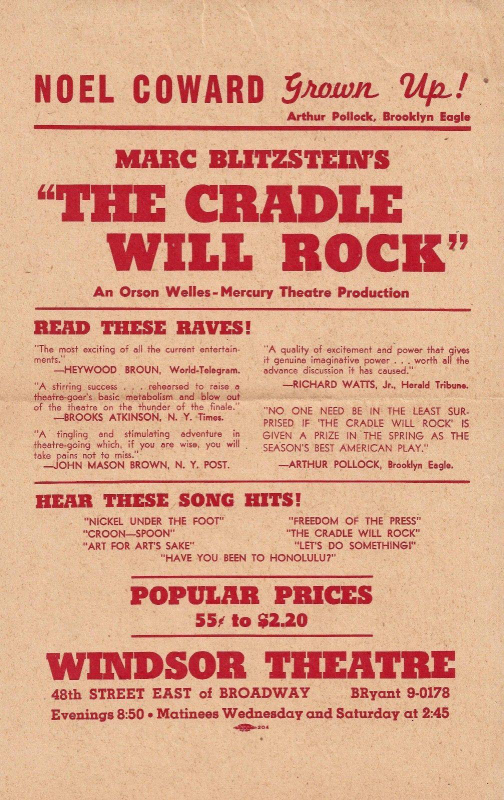 The Cradle Will Rock was scheduled to open on June 16, 1937 at the Maxine Elliott Theatre with sets, costumes and full orchestra. There had been a dress rehearsal on June 15, and the show was ready to open. Word came from Washington, D.C., to delay the opening until after July 1, 1937. The audience waiting outside the sealed theatre were led some twenty blocks north to the Venice Theatre, where the show was performed with Marc Blitzstein on stage at the piano. The actors (who paid for their own tickets) were in the audience. A single spotlight picked out the actors as their lines came. The show was done this way at the Venice for 19 performances with no scenery or costumes but with the performers finally moving on stage after they had joined Actors Equity. The show was then presented anywhere that could be found, including open-air auditoriums and amusement parks in the heart of Pennsylvania, and it was given a radio presentation on December 5, 1937 on the Mercury Theatre's Sunday night series, again, with the composer at the piano. The Broadway run opened as shown above.